Adams is famous for his dramatic photographs of the natural world. Inspired by the landscape of the American West, his imagery established the standard by which nature photography has been judged for the past 60 years. 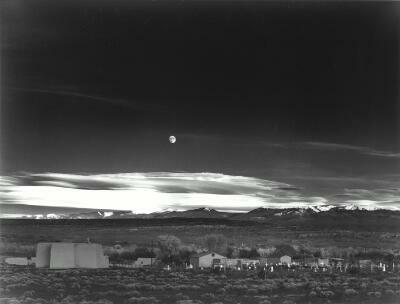 Among his most celebrated images is "Moonrise, Hernandez, New Mexico," taken on Halloween. Here, Adams captures the intense, emotional response he experienced watching the rising moon illuminate the small town of Hernandez, New Mexico. One critic noted that Adams's photographs "transcend the simple description of objects and landscape; they depict transient aspects of light, atmosphere and natural phenomena." This observation is certainly true of this enchanted image, in which an otherwise ordinary evening in a seemingly deserted city has been transformed into a powerful, mystical moment in time. This is one of Ansel Adams’ most famous photographs. On October 31, 1941 he was traveling through New Mexico. As he passed the small village of Hernandez, he was struck by the drama of the moon rising over the distant mountains, bathing the low clouds in silvery light and casting a cool glow on the desert below. Fully half of this carefully composed picture is dark and empty. The old adobe church and the other buildings are dwarfed by the broad sweep of sky. There’s no sign of human activity—the village might just as well be a ghost town. In fact, the moon highlights the scores of white grave markers in the foreground, adding to the feeling that human endeavors are insignificant in the grand scheme of nature.